Vinyl Record Album Collecting in Chicago and the USA: Attleboro Attack! I visited Rhode Island a while back on a personal getaway with my dad. I actually had business plans to travel to Seekonk which is just across the border from Providence. This was great because I knew I'd be able to check Massachusetts off my list. But flights to Boston were much cheaper than Providence so I flew there. I ended up not looking at any records in Boston proper (there were no shops in South Boston near where I was staying, and I got into town late). But during my initial drive from Logan airport to RI I decided ahead of time to stop in Attleboro as I saw they had a Goodwill and a Savers right near each other, and it was all on my way. First up was Savers. Ah yes, the familiar, comforting old white wire rack that they have at every shop in the country (and beyond!). I'd have scooped that Paul Revere record in a second but alas the jacket was empty. Saw a fairly rare Engelbert vinyl and seeing some legit Chicago polka this far from home was very nice indeed! After that it was just down the road to Goodwill. They had a unique sign with a strange logo that I had never seen before. But inside, same old stuff. Nothing of note except for a very obscure 45 with a personalized autograph from the artist. I did snag a CD for the rental car, an extremely worn copy of Candlebox debut. The CD was mint but the insert was yellowed with age. A really great album - that I seem to have accidentally left in the rental car! Well that is $3 down the drain, unless you figure I had $3 worth of enjoyment giving that album a spin while I drove around Massachusetts. I think I did. This is now state #27! 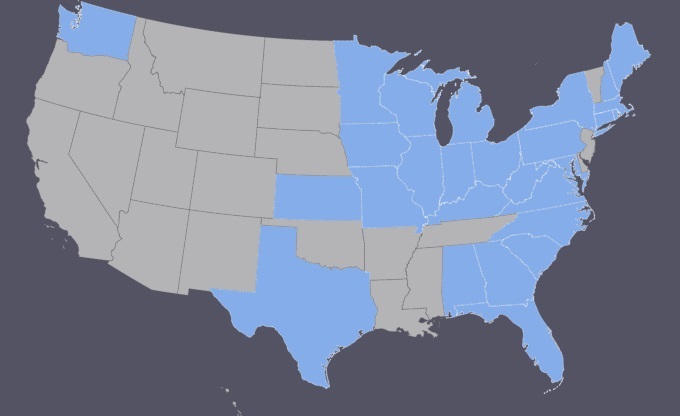 I don't think I've hit a new state since I went to Connecticut almost a year ago! Vermont, New Jersey and Delaware are killing me. I should have had a shot at Vermont during my trips to NH but never had time or was close enough. It will be nice to tackle the entire east coast.